I would like to start by saying that I am a medical professional and as such I was greatly attracted to the idea of having a first aid kit easily mounted to the head rest of my vehicle. The idea was first introduced to me at the Equipt Overland Expedition store in Salt Lake City. It was at Equipt where I first saw their Individual First Aid Trauma Kit (IFATK) mounted to a vehicle head rest in their display room. The IFATK is a premium first aid trauma pack designed for trained professionals and the IFAK is a first aid kit minus the extensive wound trauma specific materials. If you are just getting started and have no emergency response background then I highly suggest going with the IFAK. I will share with you the different available options on the market right now and a few tips and places to buy your supplies. Lets get one thing out of the way Clotting granules and Celox or QuickClot products are intended to be used responsibly! When attempting to purchase this item online I was prompted to attest that I was a trained medical professional with the authority and training to use the product. Several web sites selling pre assembled IFATK also included warnings that their kits include items to be used by trained professionals. However on the manufacturing web site for Celox it says that anyone can use their products. My suggestion is to steer clear of the powder or granular formulas as the potential for a wind gust blowing it into you eyes is high. Additionally many of these products are expensive with a 3 year shelf life. Out of all of my emergency experiences that I have been through the MOST IMPORTANT piece of equipment anyone can ever own is a CPR mask. Have CPR key chains, have them in your glove box, tie it to your head rest but have them everywhere. If you do nothing else I highly recommend that everyone at least stock up on CPR face shields and be certified in CPR either through your community college or local American Heart Association!! I have ordered three new CPR masks and key chain face shields to have one in each vehicle, on each set of keys, and in my IFATK. I wanted to customize my kit with materials that I know how to use and would feel comfortable using in an emergency and that I could easily teach my husband, who is a non-medical professional, how to use. I plan to further develop my emergency response skills and wanted a kit that could grow and expand with me. You might be thinking that you can save money by making your own DIY first aid kit and as long as you have most of the materials in your house already then you can easily make your own kit. However if you don’t have a majority of the supplies then its cheaper to buy the assembled kits. The assembled IFAK basic packs are more than enough to suit anyone and are suited to the untrained skill level and usage needs. No one should be buying the premium packages if you are not trained to use the supplies within the packs. Being certified and trained does not mean watching a YouTube video and it does involve hands on practice so that when the time comes to use the contents of your kit you can jump into action. So sign up for a BLS and wilderness emergency response training at your local community college or American Red Cross. #2. DO NOT USE hydrogen peroxide in your first aid kits or at home to clean wounds. Use Normal Saline 0.9% on an open wound to prevent killing the necessary good bacteria and to clean out the wound to prevent infection. #3. Wash your hands before and after going to the bathroom by SCRUBBING your hands and singing the alphabet to yourself in French/German/Spanish TWICE!!! To save time I want to share the more popular brands on the market right now for pre made car kits that range in price from $32.99 to $199.00. After pricing materials I discovered that I could make my own IFATK for aroun $170 because I already own most of the supplies. 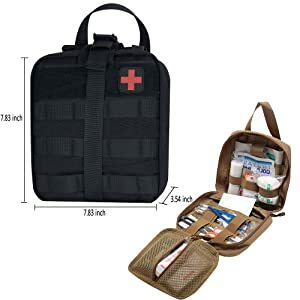 #1 Top choice quality BASIC First Aid Kit pouch for non medical professionals is the Condor for its great quality build but it is on the smaller side. My medic operates out of Saltlake City and offers 20% discounts, free shipping, and life time warranty. HOWEVER they did miss represent their bags as 4″ thick and in reality they are 2.5″ thick. Your basic IFAK is designed to treat non life threatening minor scrapes and injuries and include items that require no training when used. The trauma kits are designed to treat life threatening injuries that require immediate medical attention and are to be used by trained persons ONLY. The trauma specific supplies include blood clotting gauze, nasopharyngeal airway, wound packing materials, a tourniquet, and some times suture supplies. The lack of these higher professional products is what is going to keep the cost down for your IFAK. See my DIY IFAK tutorial. I wasn’t able to get my hands from a local distributor so I can’t attest to the quality. For the price this is the most affordable entry level IFAK that will allow you to grow and change out materials over the years. The bag measures in at 8in. x 7in. x 3.5in. which is just a tad larger than the average 8″ x 6″ x 3″ bags. There aren’t any advanced trauma supplies in this pack and that is what helps keep the cost affordable. This item arrived today and it was horribly smaller than advertised. It is listd at 4″ thick but at its best I was only able to measure barely 2.5″. This pack is very well made and high quality but I would buy the Condor over this for the ease of customer service and it is a slightly higher quality product. I didn’t understand why there was a Velcro patch on the top strap. It was irritating and would catch on things while open. The packs below contain trauma supplies that are meant to be used by trained and certified individuals. 1x – CELOX Rapid Hemostatic Z-Fold Gauze 5′ When attempting to purchase this item online I was prompted to attest that I was a trained medical professional with the authority and training to use the product. Several web sites also included warnings that their kits include items to be used by trained professionals. If you are a medical professional buy it direct and receive a 20% discount on all orders. This wins the prize of being one of the best kits on the market for the price of $175.00. It comes with its own moldable splint which is lacking from the My Medic IFAK and overall it just has a lot more content within the packaging. 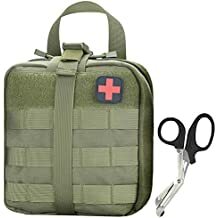 I like that it comes with a more user friendly tourniquet and the EMT pull away pouch has two extra securing straps and I will tell you below how they did it and you can do it to for your DIY IFAK. Looking for a small kit with a big impact? Look no further! This kit makes a great addition to any adventure. Mount it to a flat surface, roll cage, seat back, backpack, or just about anywhere you can think. Kit comes fully stocked with the Molle attachment system, a SOF® Tactical Tourniquet-Wide, and a 24″ moldable splint. Here are a Few Affordable DIY IFAK Bag Car Head Rest Mounting Options. That are completely DIY no first aid supplies included. I don’t personally care for this style because it has an open bag two pocket limited organization. 2. Ultimate Arms Deal $31.00! 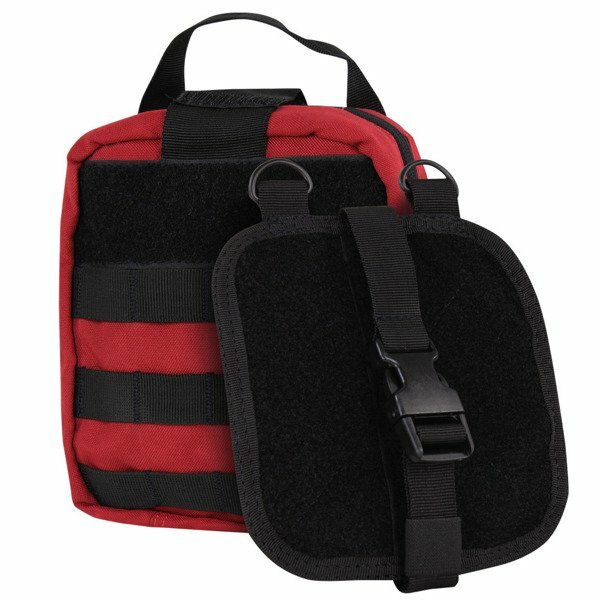 I found the Ultimate Arms Gear MOLLE Ambidextrous Drop Leg Platform + Rip-Away EMT Medical First Aid Pouch with Buckle Strap and Velcro Attachment that coincidently appears to be the exact replica of the Outer Limits Supply IFAK mounting system. This system is $31.00 which makes it at the mid-range of the general price of these bags. I like this style set up because it gives you extra attaching harness points to either mount to your vehicle (ATV, motorcycle, etc..) or to attach to the bag directly for those bumpy off reading trips. I had a chance to get my hands on a local distributor and this pack is amazing quality above average and it wont disappoint you. I liked that the feel, quality, and craftsmanship that went into making the condor pouch. I would have purchased this pouch over all others had it only been a larger size. The condor pockets have four interior corner attaching loop points for tape, scissors, or whatever you want to attach. This feature was missing from most of the other bags. The zippers are the best I have seen on any first aid pouch with what appears to be weather and dust protection. I did notice a discrepancy between the pictures and the Condor pouch I saw in person. The orientation of the middle pocket seems to be reversed in pictures A and C.
After testing out other packs I stuck with this one for its ample size. The Good: This bag is decent for anyone looking for a slightly larger IFAK carrying pouch. It comes with a free patch and scissors. The Bad: The included free items are poorly executed and cheaply made and are low quality items that give the pouch a cheap feel. The zippers aren’t weather protected like the Condor pouch and the back Velcro pull away seemed loose and cheaply made compared to the Condor. The Ugly: Within the first 24 hours one of the interior securing straps broke loose.